Disclaimer: the adjacent — and colored meaningfully yellow — graphic piffle is not intended to mean the Union Jack proper. 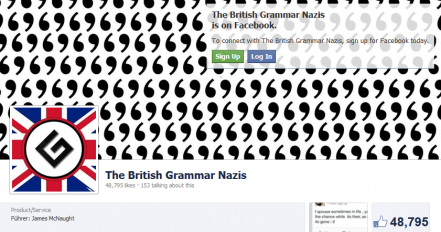 It pictures the British grammar nazis logo on Facebook. The original logo dubious pulchritude may be seen down here. Let us begin with a few fundamentals on orthography. I do not spell the nazis with a big letter. Big letters, though they do not always import reverence, are reserved for proper nouns, everywhere except a beginning. The proper noun Nazis were German nationalists. Some of those bombed London during WWII, which might reasonably connote displeasure on the part of the British people. I do not have other people’s feelings, but thus I do reckon. Much has been written about the Second World War, including Hitler’s evident lack of linguistic finesse. 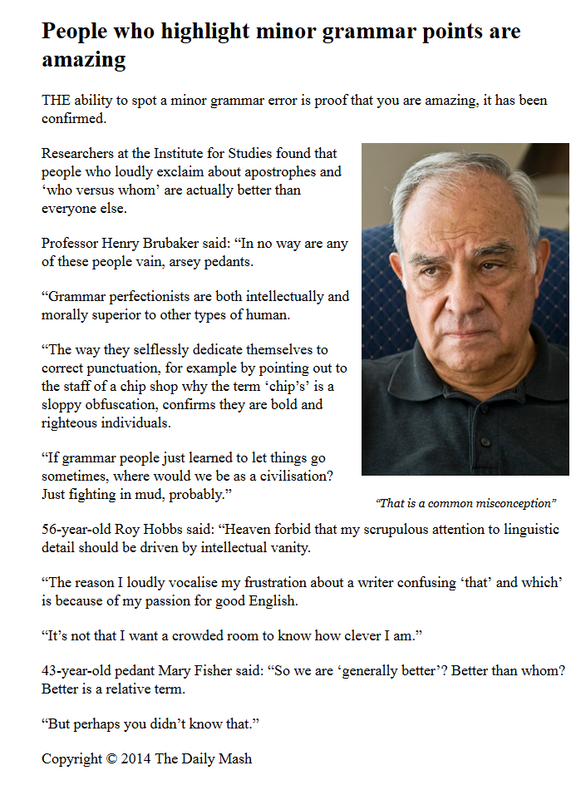 Therefore, I will do some pondering only, on the British who want to be grammar nazis. THE DAILY MASH offers observations. The way they selflessly dedicate themselves to correct punctuation, for example by pointing out to the staff of a chip shop why the term >>chip’s<< is a sloppy obfuscation, confirms they are bold and righteous individuals. The Daily Mash article appears full size, also when clicked HERE. On Facebook, grammar nazis share the article, and comment. It is only after a few lines or whiles that thought emerges. THIS ACTIVITY ALSO SHOWS WITH A CLICK. who remain linguistically impoverished by choice. THERE IS THE BRITISH LIBRARY. Let me think about statistics and implications. Should there be such nazis visiting this page, I promise a brief primer on irony after this indispensable piece of advice about living on the same planet. The site has about 50 thousand “likes”. Taking the British population alone, that would make about 50 thousand oddly deficient, among about 63 million people. Some might say it is not so bad. It is not even one percent. Still, it could be better to think literacy, going to England: the guys would not have had the UK flag for their capriccio, were it not permitted. However odd types do not dwell in big towns only, before we go to London, we try for a plain passport photo, that is, without brooches, scarves, ties, anything we do not always wear. We wave the hand broadly, getting a taxi. It is a simple, therefore legible gesture. We get a map with statues and other tourist attractions in large icons. Mailing letters, we get the recorded. They have ID strips. Seeking directions, we approach people with newspapers. They could be literate. This does not have to mean a refutation, as WIKIPEDIA EXPLAINS. Life cannot be all about affirming or denying only. Let me return to the Mash. Antonyms and synonyms in context are the answer. Laying it all out in detail to a grammar nazi looks discouragingly big a task, hence the handful of thoughts and the primary color, yellow (adjective, reference 3). Grammar nazis do not present own blogs or websites, especially with serious language work. Their picking on language realization by other people has no chance to bring anything creative, sophisticated, or productive.